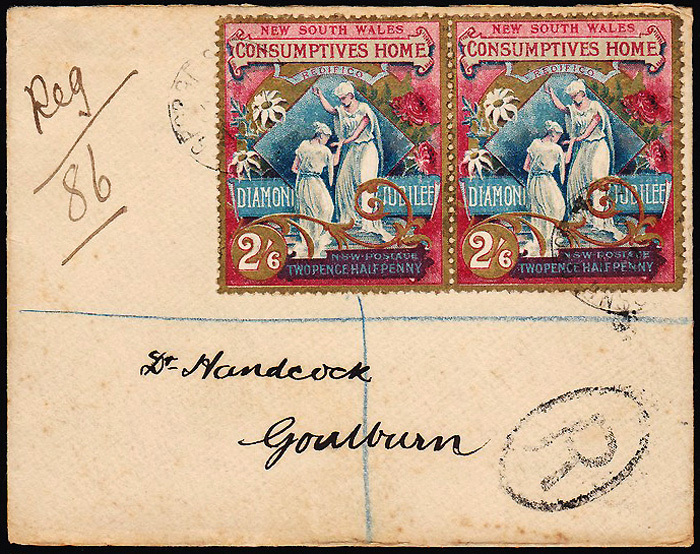 The 1897 Consumptives Home issue of New South Wales - 2½d (2/6) on cover. The 2½d denomination paid the foreign letter rate. 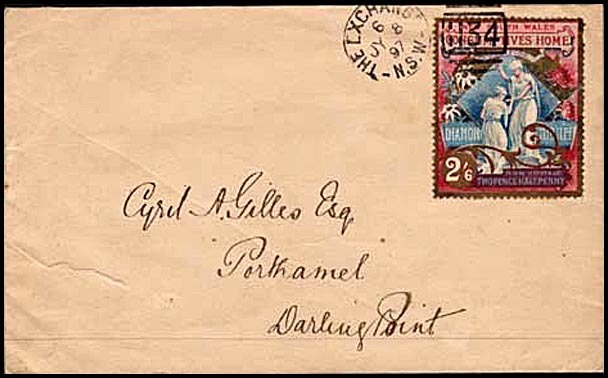 Good covers with the 2½d (2/6) stamp are scarce although there are a reasonable number of covers offered each year by the Auction Houses and on sites like Ebay and Delcampe. Many covers are in poor condition with rust spots, stains tears or folds. Good covers are those with at least a semblance of being used postally in the correct way. 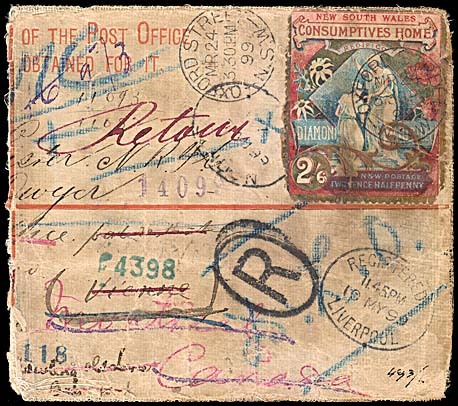 As noted previously, the postal validity of the Consumptives Home stamps ended on 31 August 1897.
mixed franking covers - the 2½d stamp with stamps from another issue. mixed frankings of both the NSW 1897 Charity stamps with another issue. First Day Cover (the real day of issue?). Park Street for local delivery. Overpaying the local letter rate of 1d by 1½d. Cancellation of 22 June is therefore the same days as the 1d (1/-) stamp was issued. 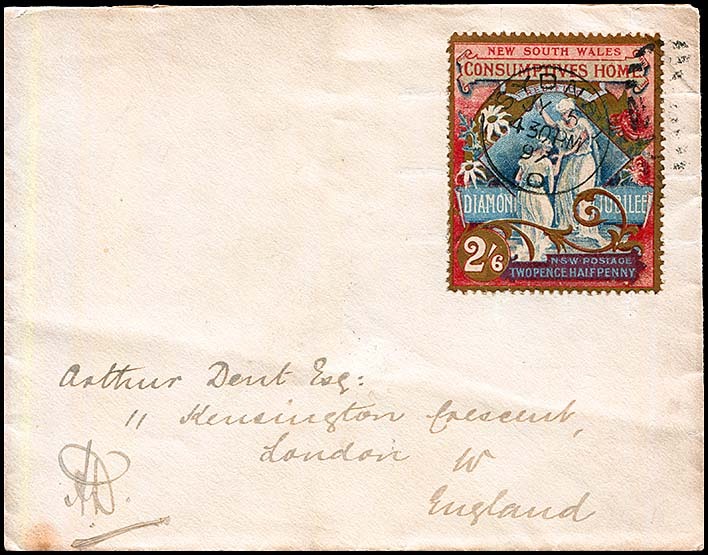 the date stamp was turned back to 22 June to frank the 1d cover and used accidently on the 2½d cover. Cherrystone July 2013 Lot 865.
other covers are clearly philatelic and "constructed" by collectors or stamp dealers. These covers were used locally within Sydney except for two which were used at Broken Hill (also for local delivery). 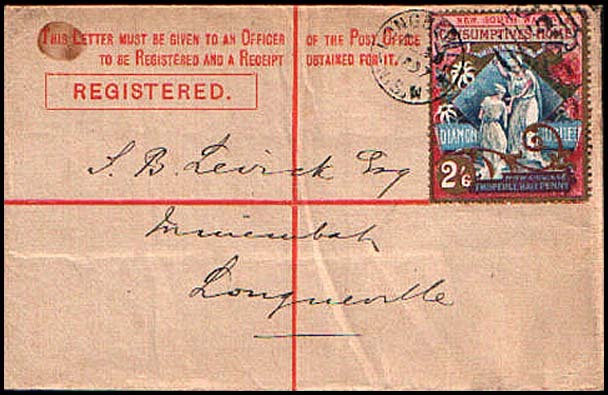 Three of the recorded covers are outside the period of being valid for postage. 3 July 1897 - Sydney duplex. Has arrival date stamp on reverse of Sassnitz-Trelleborg of 9.9.97. Is a good example of a genuinely used example paying the correct rate. Nutmeg Lot 4867 September 2006. Provenance: Chartwell Collection (Spink, May 2018, Lot 64). Sydney 10 to London, England. Has a West Kent back stamp of 9 August 1897. Flap is embossed with a ROYAL NAVY DEPOT/SYDNEY seal in blue. Has Albury transit backstamp on the same date as well as an German arrival backstamp at Hamburg of 1 August 1897. Prestige August 2012 Lot 269. Provenance: Mike Berry, Johnstone. Kiama (Barred "25" rays) to Kingstown Ireland. Kiama backstamp of 18 July and transit backstamp of Sydney the following day. Also has a Kingstown arrival backstamp of ?7 August 1897. Prestige Philately February 2008 Lot 375. Oxford Street, Sydney to Vienne - 24 March 1899. The cover was redirected via Tahoma, Washington (21 April) to Montreal, Canada (2 May) but could not be delivered and so was ultimately returned via Liverpool (10 May), Bradford, Yorks (15 May) and Brussells (17 May) - where it "had a holiday" until 3 June - before returning to Sydney (14 September) and thence to the Dead Letter Office in Sydney (16 September). Provenance: David Wild. The Exchange to Sydney. 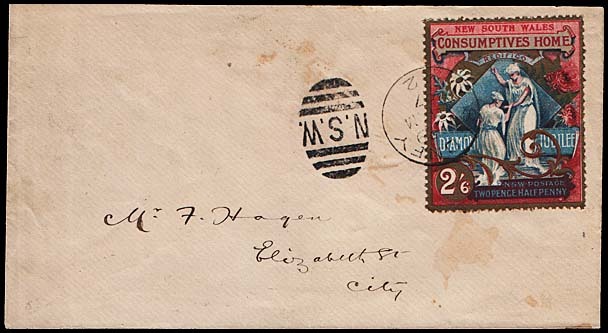 3 July 1897 with Barred Numeral 113 duplex. Overfranking by 1½d for a local letter. and September 2017, Lot 294. Prestige Philately December 2009 Lot 240. The Exchange to Darling Point. Addressee bears a striking resemblance to the person nominated on the Berry cover below. Sydney to Elizabeth Street, City. 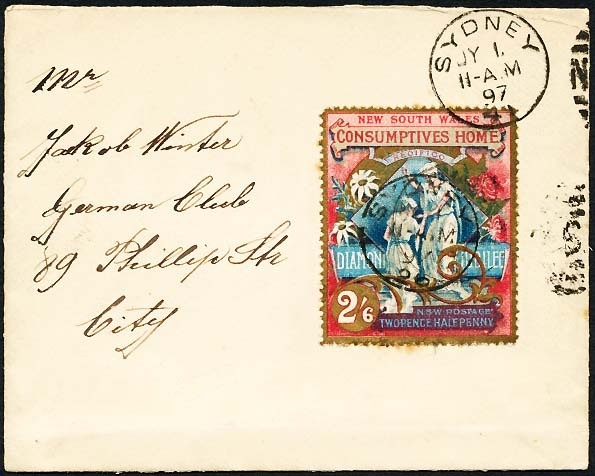 Addressed to Fred Hagen who was one of Sydney's first and most influential stamp dealers. Ebay (techgifts) October 2014, September 2018. Petersham for local delivery (a long cover). Prestige Auctions - August 2012 Lot 268; and May 2014 Lot 1336. 23 (or 28) December 1897. On pre-printed registered envelope with 3d prepaid registration fee paid with printed stamp image on flap at reverse. List of covers with single frankings of the 2½d (2/6) stamp. 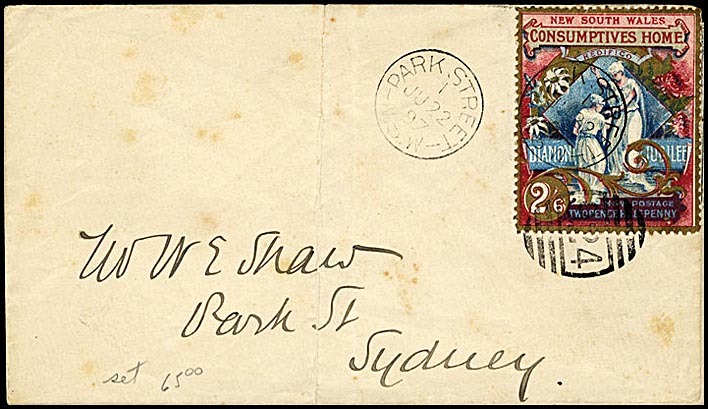 This list records the known covers of the 2½d (2/6) NSW Charity stamp used as a single franking on cover. The date stamp and duplex are upside down with the duplex clear of the stamp. (at 11 am). Phillip St, City. 02 July 1897 Mosman Mosman Matthew Bennett February 2003 Lot 567. (Mrs Arthur, Military Road) Prestige August 2012 Lot 266. Prestige August 2013 Lot 359. Status February 2007 Lot 1469. 03 July 1897 Sydney 3 Helsingborg, Sweden Nutmeg September 2006 Lot 4867. 03 July 1897 The Exchange Sydney Grosvenor June 2017, Lot 119. (to Mr. C von F(?)reehnen). Millenium April 2018 Lot 25. Stamp has two selvedges showing it is from position 30. Cover has horizontal crease under the stamp. (to Arthur Dent Esq.) Spink, May 2018, Lot 64 (part). (Mrs Arthur Military Road) Millennium February 2005 Lot 50. Date stamp extends beyond top of cover legs of M just showing) part of duplex above stamp, stamp straight. (Mrs Arthur Military Road) Corinphila November 2017 Lot 6127. Date stamp within cover, duplex extends to top perfs, stamp rotated slightly counterclockwise. 6 July 1897 Ashfield (193 duplex) Ashfield to Master J. F. Stephen. Millenium February 2005 Lot 49. 08 July 1897 The Exchange Darling Point Ebay (arphil) February 2011. (addressed to G. H. Gordon). 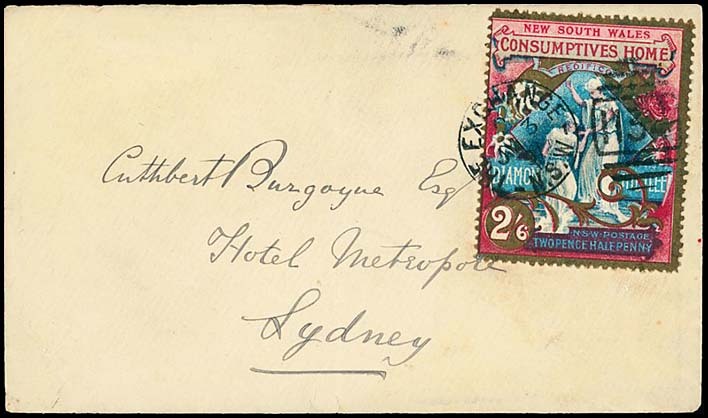 SYDNEY etc is double printed; S (of NSW) is to the left side of the perforations. 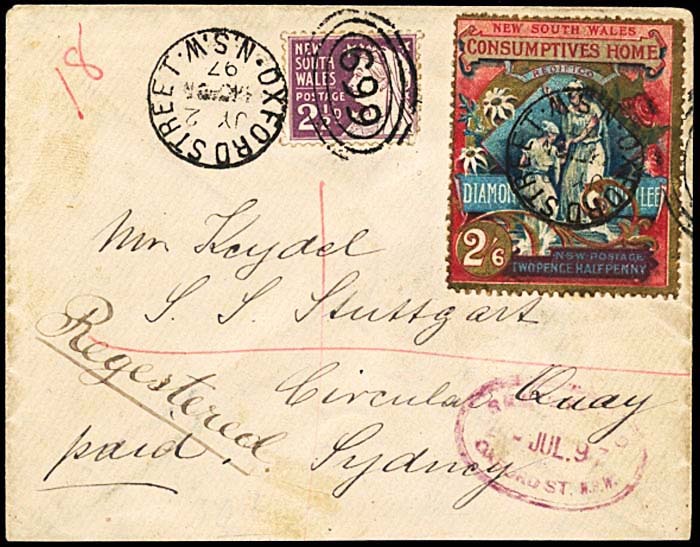 SYDNEY is clear of the stamp; S (of NSW) is cut by the left side perforations. (addressed to H. B. Bilborough at Craigmounting). Stanley Gibbons, October 2017. 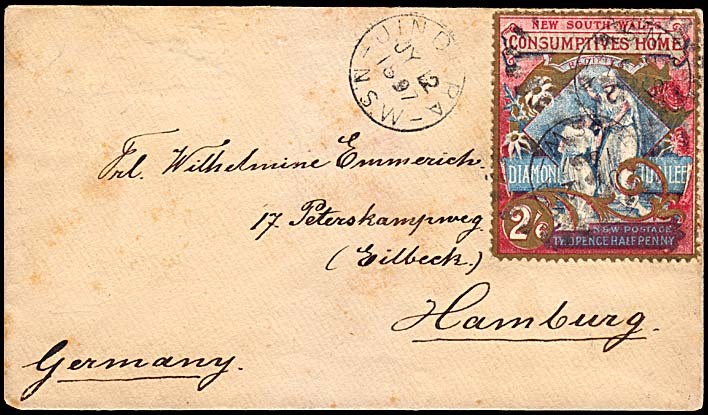 12 July 1897 Jindera Hamburg, Germany Prestige August 2012 Lot 269. 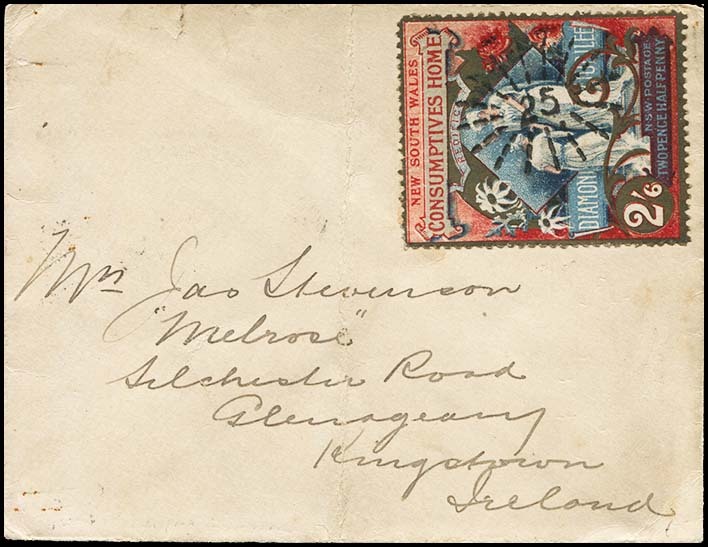 18 July 1897 Kiama (Rays 25) Kingstown, Ireland Prestige February 2008 Lot 375. (Mep M&L Lodge) Mossgreen April 2015 Lot 252. JY 15/3 PM/97. On the reverse there is a two line Petersham date stamp of AU 5/97). Millennium April 2003 Lot 543. (to Mr. C. A. Gilles) Spink Sale 13023 Lot 685. 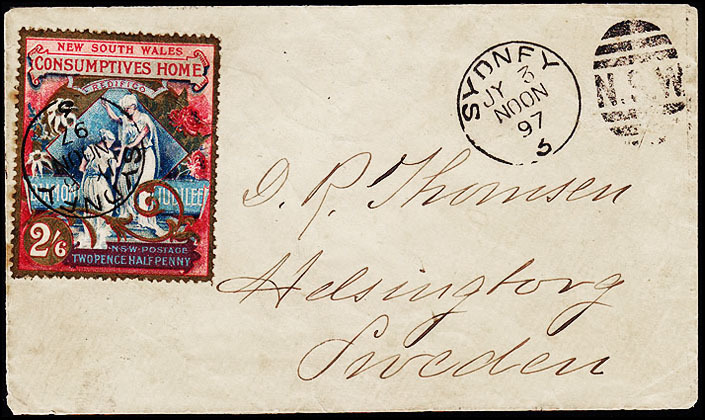 24 August 1897 Greenwich with 1207 Barred Numeral duplex. (to Miss. E. P. Bedford). Prestige August 2012 Lot 278. Prestige May 2014 Lot 1336. (to Master Stephen). Millennium February 2005 Lot 49. 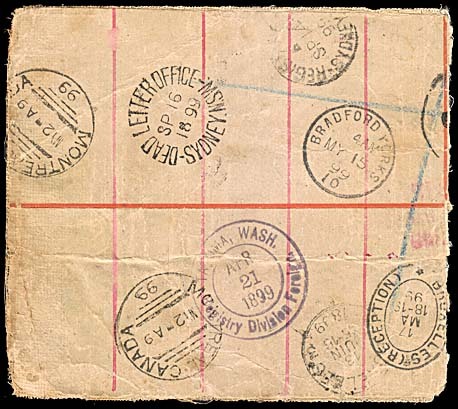 (Barred Numeral 1331) Broken Hill - to Mr. D. L. Perston. Ebay March 2017. 1897 (unclear duplex) Sydney Toowoomba, Qld Cherrystone, July 2006, Lot 1327. 24 March 1899 Oxford Street Vienne Ebay September 2013. Four covers are known with just the two 2½d (2/6) Charity stamps. Two of these are pairs and the other two have two singles. Rare use of a pair on cover (three covers with a pair of the 2½d (2/6) stamp are recorded). Prestige Philately August 2012, Lot 270. Status Auctions December 2012, Lot 1748. Two single 2½d (2/6) Charity stamps well tied to the cover with 337 rays numeral cancellation. 5d registered intra-colonial rate (3d registration fee and 2d postage). Millennium Auctions April 2003 Lot 544. Two single 2½d (2/6) Charity stamps on a cover front. There are only five covers with a single 2½d (2/6) stamp and stamps from another issue. Two of these covers were sent to England while three were sent to Queensland. Oxford Street to Circular Quay (to the S.S. Stuttgart). Has 699 Oxford Street duplex. In combination with 2½d Prussian blue (Die II) Queen Victoria from the Jubilee issue. Has registration number 18. 5d registered letter rate. Paid with 2½d purple (Die 2) Queen Victoria Jubilee. Prestige Philately April 2009, Lot 354. See corresponding cover in 1d Covers page (Combination). Harroldtown near Brisbane, Qld. 2½d (2/6) pair plus 2d Jubilee and pair of ½d grey Millenium Feb. 2005 (73).